Call it a hunch, but I’m starting to think this whole mobile thing is really going to take off. And what better use is there for your phone (other than to take a selfie with you and your favorite lawnmower) than to check out TheExpeditioner while you’re on the go (or while you’re lying on your bed, in the bathroom, waiting in line at the unemployment office or my personal favorite, sitting at your computer)? 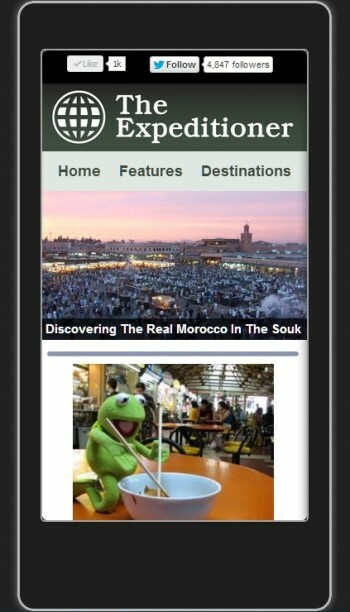 TheExpeditioner is now fully customized to work on your mobile device, with a full screen feature article slider, a new customized easy-to-read post experience and the ability to check out our back catalog of articles from around the world. Please note, reading TheExpeditioner and driving at the same time is not recommended, unless you’re really good at using your phone while operating heavy machinery, which I am by the way. In that case, feel free to do so.